Astaxanthin is the most powerful carotenoid antioxidant for free radical scavenging: it is 65 times more powerful than vitamin C, 54 times more powerful than beta-carotene and 14 times more powerful than vitamin E.
crosses the blood-brain barrier and the blood-retinal barrier (beta-carotene and lycopene do not), which has great benefits for the health of your eyes. 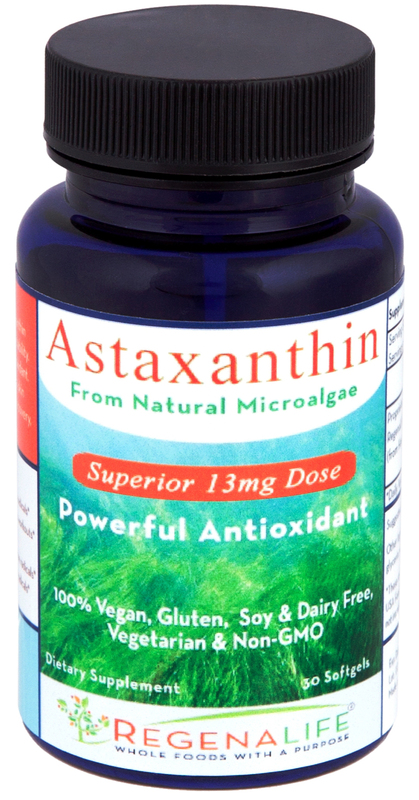 Astaxanthin is hailed as "One of the Most Powerful Antioxidants Ever Discovered". Astaxanthin helps to prevent sunburn and protects you from the damaging effects of radiation such as flying in airplanes, x-rays, CT scans, etc. 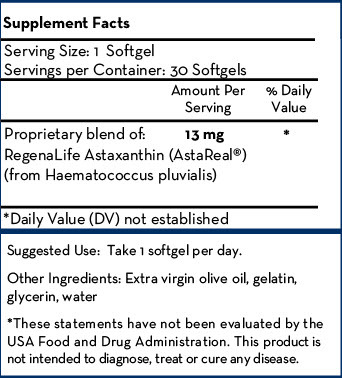 Astaxanthin is a Carotenoid produced by the microalgae Haematococcus pluvialis. Astaxanthin is more powerful than beta-carotene, alpha-tocopherol, lycopene, and lutein--other members of its chemical family. Astaxanthin has a VERY STRONG free radical scavenging activity, and protects your cells, organs, and body tissues from oxidative damage. Carotenoids are the compounds in your foods that give you that vibrant cornucopia of color -- from green grasses to red beets, to the spectacular yellows and oranges of your bell peppers -- as well as all of the beautiful flowers in your garden. Astaxanthin is the most commonly-occurring red carotenoid in marine and aquatic animals. It gives salmon its characteristic pink color. Salmon and other sea creatures cannot synthesize astaxanthin themselves and must obtain it from their diets which include zooplankton and krill. These smaller organisms feed on the microalgae, which are the original producers of the pigment. What are Astaxanthins other Benefits? How Does Astaxanthin Benefits Your Heart? in one double-blind, placebo-controlled study,15 people who took 12 milligrams (mg) of astaxanthin per day for eight weeks had a 20 percent decrease in levels of C-reactive protein (CRP), which is a marker for heart disease. CRP is essentially an indicator of systemic inflammation in your body, and lower levels tend to be associated with a reduced risk of not only heart disease but many other chronic health problems as well. Needless to say, a 20 percent decrease in CRP in just two months is a rather dramatic reduction in disease risk, and one that few if any drugs can match. The same powerful antioxidant properties that protect the algae from the sun's rays will protect your skin as well. It will take a few weeks for the pigment to build up in your tissues, so you can't just swallow a few pills just prior to your sun exposure and expect miracles. Take your astaxanthin daily with a small amount of healthy fat, such as butter, coconut oil, eggs or Krill Oil will optimize its absorption.